If you’re reading this blog, you’re probably familiar with out-of-home media and its advertising possibilities. And, if you’re reading this blog, you’re definitely familiar with the digital world, including digital advertising. 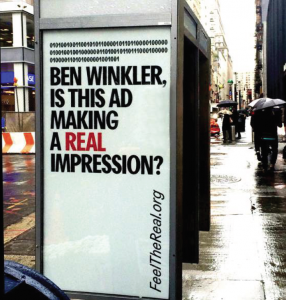 The Outdoor Advertising Association of America recently wrapped up its “Feel the Real” campaign to demonstrate the power of OOH, especially in an ever-growing, confusing digital landscape. Viewability is one of the most common and important metrics by which advertising is measured. But, as of 2013, 54% of online display ads aren’t visible. Nevermind consumer awareness or clickthroughs or ROI, less than half of digital ads aren’t even being seen by users. To compound the problem, 61.5% of Internet traffic isn’t from real users. It’s from bots. Digital fraud is rampantly creating false impressions and reporting. It’s turning one of digital’s greatest strengths, trackability, into one big weakness. Non-viewable ads + unchecked digital fraud = a lot of money wasted. Out-of-home media is one of the most enduring forms of advertising. It’s survived and thrived through every technological and creative innovation of the last century. The OAAA knows firsthand the power of OOH advertising, since its founding in 1872. Moreover, it knows why: out-of-home ads are real. We know OOH has high impact. It augments the most successful and creatively impactful campaigns as part of an integrated media mix. 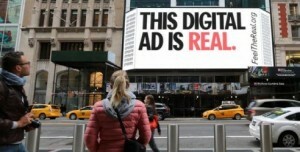 What’s more is that OOH actually drives digital traffic. According to Arbitron, OOH is nearly 3 times more efficient at driving online search activity than TV, radio and print. As an advocate for the industry, the OAAA wanted to positively demonstrate the power of OOH media, instead of attacking the issues with digital advertising. What better way to accomplish this than with OOH media itself? More than 18 of the top media companies donated inventory in the top 20 markets for advertising, including New York, Los Angeles, Chicago and Miami. The inventory included unsold units from billboards to digital elevator signs to Times Square spectaculars. The message and creative elements lived up to what you would expect from a group of seasoned advertising experts. The bold and simple message, “This ad is real,” follows the Association’s own best practices for clear OOH advertising. The single design element of binary code makes the comparison between OOH and digital clear, and the lack of branding accomplished intrigue to drive more people to learn more. One of the coolest elements of the campaign was the targeting. The organization specified eight different levels of customized messages. Market-specific advertisements targeted cities, while landmark-specific ads tweaked the copy around an area like the Smithsonian or the Capitol building. Medium-specific copy demonstrated the wide variety of OOH mediums. But that wasn’t even good enough for the OAAA. They targeted ads to the target themselves- agencies and media planners. Agencies were mentioned by name nearby their main offices, and media planners and even CEOs were called out on their way to work. Each ad included the FeelTheReal.org website. Like the campaign’s various messages, the site is simple and targeted. Using a simple question as the first interaction, the OAAA segments users into marketing folks and those just curious about the campaign. Marketing and advertising professionals got the real facts and figures about the issues surrounding digital advertising and the strengths of OOH. The general population took a simple “Reality Test” to see how real their experiences had been lately, including questions about whether they’d looked at the stars or experienced Instagram jealousy in the last month. From a creative perspective, the campaign was phenomenal. The implementation was seamless, and the buzz it generated was real. The next question: did it work? Stay tuned, we’ll be taking a look at the results of the campaign in an upcoming post. Until then, check out FeelTheReal.org and give some thought to how real ads and real impressions can deliver real results.